There is no such thing as a truly unbiased review. We all have our favorites going into a decision. I’m a confessed Apple enthusiast. I am also a Bose man of many years. This is like the Super Bowl meeting of my beloved New England Patriots and by cherished Seattle Seahawks. I was thrilled for both and sick for both. In this kind of competition, neither brand gets the benefit of the doubt. They are both on equal footing. I have had a lot of experience with both companies. I know what to expect. This is one of those rare times when brand loyalty cancels itself out. The only thing remaining are the products. Both Apple and Bose know how to do bluetooth right. They are both the chief innovators in the field. I don’t see anyone coming close for a long time. For the purposes of comparison, Apple and Bose focus on different aspects of the bluetooth challenge. They both nail it in their way. Bose did with these headphones what they have been doing since they have been making premium bluetooth products. That is to say, they didn’t innovate this time around. But their solution still stands as one of the best in the industry. Bose allows you to be paired with up to 6 devices at a time. But what is truly impressive is that you can have two items paired at the same time. That is the real magic. You can be listening to something on your laptop, and have your iPhone ring through the earphones. No switching required. Apple hasn’t figured this one out. Although the AirPods can be paired to multiple devices at once, only one can be active at a time. You have to manually switch the output option to AirPods on the target device before getting sound from it. You don’t have to unpair and repair. But you do have to manually switch. This may not be a problem is you only use the earphones with a single device. But I tend to use my bluetooth earphones with two or three devices throughout the day. Apple treats the bluetooth connection like a single, phial wire being connected to a device. Bose treats it like two wires that are easily hot swappable between six devices total. For the way I work, Bose wins bluetooth hands down. These are not the only bluetooth talking points. Apple has revolutionized the way bluetooth earphones are paired to devices. I haven’t seen anything this cool in bluetooth in a very long time. No one else is even thinking this way. I also found Apple’s bluetooth connection to be rock solid in areas where even the Bose might have problems. While Bose is the hands-down winner in this category for me, for the rest of the world, Apple has made it a lot tougher decision. One of the most important factors when it comes to earphones is how well they fit your ears. Not only do they have to fit well, they also have to be comfortable. Many otherwise great headphones are taken out of consideration at this stage. Despite my great anticipation, I am sad to report that the AirPods do not fit my ears very well. In the short time I used them, one fell out while I was outside. Considering my vision, I was lucky to find it. I was on crutches at the time and going through some vigorous activity. But they were slipping frequently before that experience. I was never comfortable with them being in my ear. What I mean is that I always felt like they were about to fall out, and was always reseating them. Their fit was always top of mind for me. 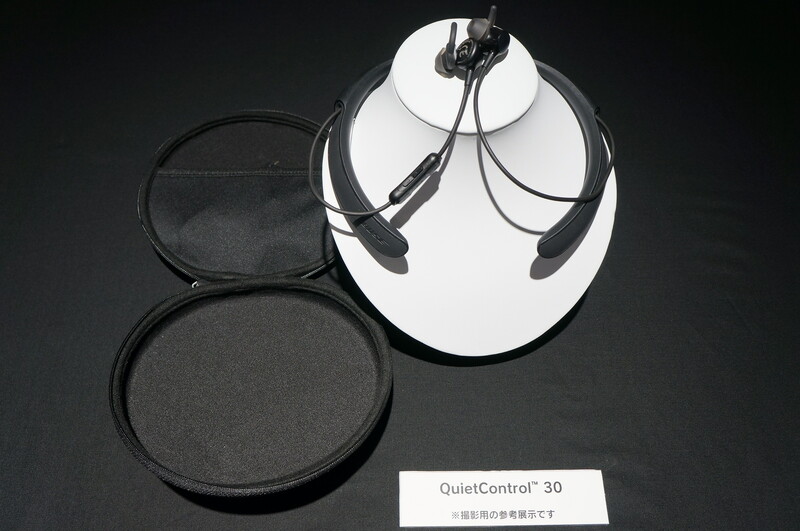 The Bose QC 20 is the predecessor to the current QC 30. The 20s had a controversial design. In addition to being wired, they had a bulky box attached to the cable. It was a polarizing design choice. Bose replaced that design with yet another polarizing design choice. They are wireless like the SoundSport models. But they employ the neckband style which many people absolutely hate. I am mostly indifferent to the neckband. It has pros and cons. It is made from a lightweight, soft touch material that is comfortable enough to wear all day and forget you are wearing it. But the real star of the show is not the neckband and cable connecting the two earbuds. It is the way the buds fit into the ears. These buds do not shove intrusively into your ear canals. They sit casually outside the ear canals. What holds them in place are a set of clever flanges that Bose pioneered some time ago, and that have been much copied by competitors. Despite the copies, Bose still does it best by far. They comfortably sit in the ear without any hint of movement or instability. You can wear them all day. Not only does the QC 30s trounce the AirPods in this category, they trounce every other earphone in the industry. For this round, the Bose not only fit better but I could finish the day with them still running strong. Innovative is one word you can use to describe both these companies. Integrity is another of their shared qualities. You really don’t have to worry about battery tests with either of these devices. At minimum, you get exactly the battery life they say you will. In actuality you can expect even more. This is one area where they both have established reputations for under-promising and over-delivering. That said, it is impossible to say which has the better battery life story. The AirPods provide you with 5 hours of battery life on a charge. But the case provides an additional 24 hours per charge. With both case and AirPods fully charged, you should expect about 30 hours of battery life. 5 hours of listening should take most people through the day without having to worry about charge levels. But if you do have one of those days when you are out and about, perhaps on a plane, you can use the fast-charge case to top them off. 15 minutes in the case gives 3 hours of charge. When they are close to drained, you can charge one while listening with the other. Change ears, and you are rocking and rolling for another five hours. Rinse and repeat close to 6 times before having to charge the case. That is some serious battery fire power. The QC 30s have to be plugged in with mini USB. They cannot be charged one at a time. And they do not come with a recharging case. But they do last 10 hours on a single charge. That should get just about anyone through the day, and most likely two or more. You can always buy a USB charger and get an adaptor. But that is a much more bulky package than the AirPods charging case. The real question is, what happens when you forget to charge the headphones. The AirPods have their charging case as a backup. The QC 30s have a longer battery life. But I think Apple has the better solution. You don’t need to carry backup earphones with the AirPods. I would still carry backups with the Bose. If you are chasing between these two devices, sound quality is not going to be the deciding factor. There is a huge price difference between these two products. The Bose are $300 earphones. AirPods are $160. At nearly twice the price, the QC 30s should sound better. And they do. But that is not what we are comparing. The AirPods are plenty good enough so that you don’t have to worry about it. The highs are fine, as are the lows. To my ear, the meds are lacking. The Bose does a great job throughout the range. The QC 30 is the latest in the line of noise canceling headphones from Bose. No one does it better. It’s not even close. If you want noise canceling headphones, Bose should be alone in your consideration. The QC 30s are the latest, and best iteration of noise cancelation. With Bose, QC usually stands for Quiet Comfort. This is the first time it stands for something different: Quiet Control. That is because noise cancelation is not just an on or off option. You can easily adjust the amount of noise cancelation you get. If you are a set it and forget it type person, this feature will not be as important. But if you are a volume micromanager, you will appreciate the control you have over noise cancelation as well. The little remote has an extra set of buttons on the inside that controls the noise cancelation. You might think things would get confusing with all those buttons. But it doesn’t. They are even shaped differently. So there are plenty of cues to let you know which are volume and which are noise cancelation. I think of these buttons as my volume control for the world. The volume buttons determine how much sound comes from my device. The others determine how much sound comes from the world. You can actually turn the world up a bit, like a hearing aid for when you want to hear your surroundings. There is no reason to ever take them out of your ears. Apple could include noise cancelation if they wanted to. They own beats. They have the technology. But it will not be in something as small as AirPods, or as cheap. This feature, and a bit of sound quality is why you pay an extra $140 for the QC 30s. Is it worth it? Yes. It bears repeating that this is not a fair contest. These are not just different products, but different categories. They sit in different price ranges and serve different needs. But the reason they are paired in this writeup is that they are the most interesting earphones to come out this year. They can still be compared by asking which of them best lived up to their charter. At the end of the day, I returned the AirPods. My wife returned the AirPods for the same reason. We could not trust them to stay put when active. Apple has chosen a one-size fits all model. That does not work with pants. And it does not work with ears. Apple is smart enough to offer multiple watchband sizes. But they are not smart enough to realize that all ears are not the same, and cannot accommodate only one sized module. I suspect they do realize it, but they just don’t care. For this short-sighted arrogance alone, Apple loses this round. But for those who have the right sized ears for Apple, they are a great option. But somehow, needing to have the right sized ears feels a lot like needing to have the right sized skin color for facial recognition to work. It feels discriminatory and wrong. And they could fix it by including 3¢ worth of ear tips in the package and reworking the charging case to accommodate the tips. There is simply no excuse for this exclusivist approach. To be clear, I think this is wrong. I hate it. And I think Apple should be censured by the market for their decision to work in this way. It is not just that they don’t fit my ears. It is that it leaves out a whole class of people. And it is completely unnecessary. Besides the design being somewhat annoying (an issue for the predecessors as well), the Bose QC 30 hits all the right notes. You will not have some arbitrary problem with fit. You will not feel that any part of the sound spectrum is missing. You will likely use their bluetooth innovation more than Apple’s. And you will find that it is easier to justify their price. Will they stay in your ears at critical times? How well can you keep up with the three necessary components? Is the sound quality going to let you down for that one album you love? These are simply not questions you would ask of the Bose. I can wholeheartedly recommend them to anyone with the cash. They’re worth it. I cannot make the same recommendation for the AirPods. Thanks to Apple’s approach, they are guaranteed to leave a lot of us out. I wish the company that makes computing accessible for the rest of us would have made earphones for the rest of us as well. Newer:New Tech for the New YearOlder:Going Pro: Should You? Or Shouldn’t You?